When herd production record data is analysed, some changes in specific reproductive parameters may suggest reproductive failure due to PRRS virus infection. This may include: increase in late term abortions (± ≥80 days), early farrowings or number of mummified fetuses, as well as increase in number of weak-born and decrease in live-born pigs. Cyclic returns to estrus and early abortions are much less common. Likewise, an increase in preweaning mortality and respiratory problems due to bacterial complications occur, (see section “3. Concurrent infections”) or if herd performance is suboptimal, PRRS should be included in the differential diagnosis. It is important to keep in mind that the presence of concurrent infections in the respiratory form of PRRS is very common. This phenomenon blurs the clinical picture and complicates the diagnosis based on the clinical signs. The clinical history can be useful to predict or anticipate the consequences of PRRS virus infection on a given farm. Also, it can be essential to interpret the clinical signs and the changes in the production record observed during an infection. In this sense, three main scenarios can exist (see section “3. What happens in a confirmed PRRS virus farm?”). Briefly, PRRS virus infection in a PRRS virus-free farm can be devastating; clear clinical signs can be expected in this situation, since none of the animals have immunity against the virus. If there is an introduction of a new strain in a PRRS virus-positive farm, the final outcome of the infection will be unpredictable, but usually a less severe outbreak would be expected. Last of all, during the re-circulation of a farm-specific strain, a far less severe outbreak would be expected; nonetheless, once again, the final outcome is unpredictable since it depends on several factors. Diagnosis of PRRS must be tackled differently depending on the previous status of the farm. 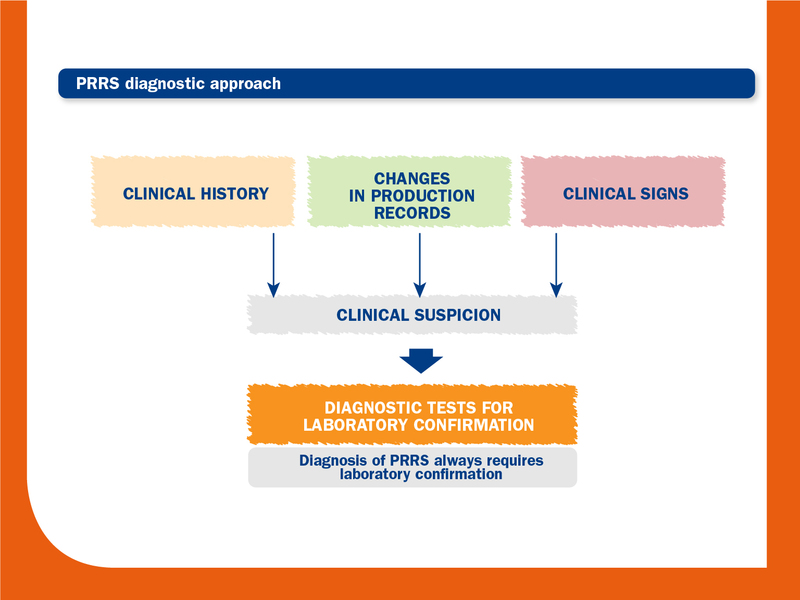 Distinguishing PRRS from other diseases that present similar lesions, reproductive failure or respiratory signs. 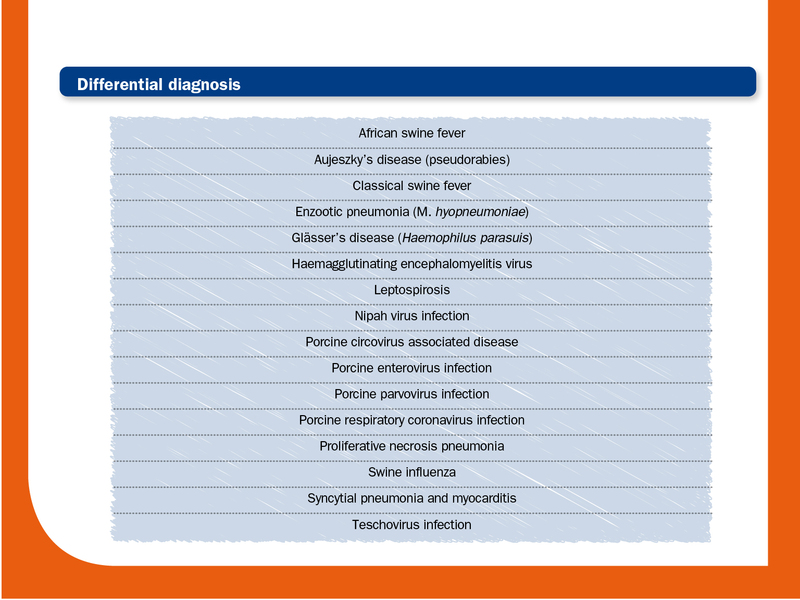 The following table shows some of the diseases that could be included in a differential diagnosis of PRRS. The diseases that should be included in the final differential diagnosis for a given case will depend largely on the clinical picture, the age of the animals, and the region.